Handy Password manager is built in your browser in the form of an additional toolbar that appears below Internet Explorer toolbar or Mozilla Firefox toolbar. 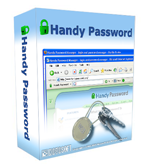 With the help of Handy Password toolbar you can perform all the basic functions without even launching Handy Password. You will be able to use all basic features through the browser window. Handy Password can work as Internet Explorer toolbar and Mozilla Firefox toolbar. It is smoothly integrated into the interface of both browsers and greatly improves Internet browsing experience. In addition, Handy Password allows quickly opening your favorite Internet pages in just one click on a bookmark that appears on the browser toolbar. It can even keep bookmark categories on the toolbar. For example, you can create a folder where there are bookmarks to your email accounts. By just clicking the folder and selecting the bookmark you will access your mail account and you don't even have to fill in the login and password fields and press enter. It will all be done by Handy Password automatically while all you have to do is to relax and enjoy the process. The browser toolbar can be locked automatically for security reasons. For example, if you leave the computer with the Internet browser open, you can ask Handy Password to automatically lock the toolbar after a period of time so that no one can ever view you personal information. To do it, you should only specify the period of time over which the lock should be activated. You can activate or disable the toolbar lock within a browser and you don't even have to launch Handy Password application. Handy Password browser toolbar is extremely intuitive and user-friendly. It really adds several useful features to the browser and improves the quality of your Internet browsing.